I'm the type of person who likes to make sure I have everything in place for any kind of event or holiday as early as possible. 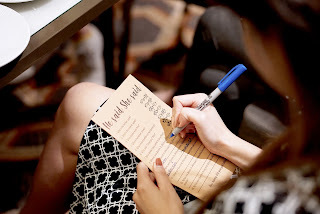 The idea of turning up somewhere and hoping for the best makes me feel very nervous, but when it comes to big things like this, it's definitely a good idea to start preparing early. This means, rather than doing all the preparation at once and pushing yourself too much, you can take your time with it, sorting out just little bits and bobs every month until it's all sorted. As upsetting as it might be, there might be some cases where you physically cannot make a hen do. I'd been umming and ahhing about doing this post, as I know I'm incredibly lucky that I can still do a lot of physical activity compared to some people who live with Fibromyalgia. Despite this, I still often have to turn a lot of things down because I know I'd be asking way too much of my body to physically handle it. So this might be the case for some people, for example you might not be able to fly, so a hen do abroad wouldn't be manageable. In cases like this, it's always worth speaking to the bride or the bridesmaids to see if a small hen do at home is on the cards too, so you can still spend some time with the bride making sure she has a fantastic run up to the wedding. It doesn't matter how much preparing you do to keep a flare up at bay, sometimes it'll have a mind of its own and just turn up whenever it wants! As annoying as it might be to have to take yourself away from the party, it's a good idea to have everything at hand that you would normally need when you feel a flare up coming on. This might be medication, a heat/ice pack, an eye mask to block out the light, whatever it is that you reach for during a flare up. Having these with you will make it a lot easier, as even if you are out of action, at least you have everything you would need at home to make it just that little bit easier. This is of course only if you feel comfortable, but it's a good idea to let them know before hand if there's anything you feel you might not be able to do. It might be that out of the whole day/weekend, you might only have to miss out on one activity, which in the grand scheme of things might not be too bad at all! It could also give you some time to recharge on your own, getting yourself ready for the rest of the hen do. Chances are, if you're going to the hen do, the bride is a close friend so will 100% understand if you have to sit something out or go at your own pace. Whenever I start planning things, I always think to myself 'this will be worth the X amount of days of pain'. Sometimes it's worth readying yourself for that (where possible of course) to be able to spend some quality time with your friends celebrating something great. This is definitely me for these hen do's, I know adrenaline will get me through it as I'll be too busy focusing on making sure everyone there and myself has a great time. I know once my head hit's the pillow in my own bed once I'm back, it'll hit me like a ton of bricks. For me though, there was absolutely no doubt that I would be going to these hen do's, and even after I'd still do it all again. It's important to still do what makes you happy, instead of giving into the fear of a flare up. So that's my short list of things I'm doing to make sure I'm ready to go for these hen do's, so hopefully if anyone out there has one coming up this might come in handy! 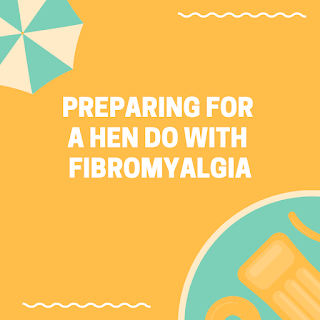 I'm half expecting a few eye rolls too, I know some people might still think I make up my fibro because I am physically able to go to a hen do...but hopefully that's not the case! I'd love to hear everyone else's tips for this, anything to make people living with a chronic illness be able to live their life to the full!